Click below to send us a message! The XTENDEX?S-Video Extender transmits S-Video locally and remotely up to 600 feet away from a S-Video device using CAT5/5e/6 cable. 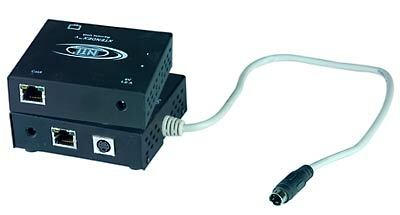 Each video extender consists of a local unit connected to a S-Video device, and a remote unit connected to a monitor or TV. Sharpest and clearest video quality over CAT5 of any manufacturer. Supports maximum 800x600 S-Video resolution. Supports local and remote S-Video monitor/TV. Available with optional stereo audio. Use in-house CAT5/5e/6 phone wiring to locate a display remotely. Supports computers and video devices with S-Video output. Optional stereo audio support - dual RCA audio plugs. Crisp and clear 800x600 video resolution. Female 4-pin miniDIN connector for local monitor/TV. Optional stereo audio support - 3.5mm stereo jack. Crisp and clear 800x600 resolution at 600 feet. Optional 3.5mm stereo audio connection. Use CAT5, CAT5e or CAT6 UTP straight through cable for TIA/EIA-568B wiring terminated with standard RJ45 connectors. 110 or 220 VAC at 50 or 60 Hz via AC adapter. Use the PWR-48V-9V0,6A or PWR-12V-9V0,6A DC-DC power converter to install the local and remote units in a Telecom environment. Video quality adjustment for different lengths of CAT5/5e/6 cable is done manually for the video-only extender and automatically for the audio/video extender. Push buttons on the side adjust video quality on the video-only units. The setting is automatically saved to the unit. The next time the unit is powered the adjustment will be recalled. Operating temperature: 32°F to 100°F (0°C to 38°C). Storage temperature: -20°F to 140°F (-30°C to 60°C). Stereo audio can be heard both locally and remotely. Frequency response: 20 Hz to 20 kHz, +/-1 dB. Maximum I/O levels: 3.1Vp-p (line level).